The Prime Minister has announced that Lieutenant General Angus Campbell will become Chief of the Defence Force from July, replacing Air Chief Marshal Mark Binskin. Major General Rick Burr is to become Chief of Army, replacing Lieutenant General Campbell. Rear Admiral Mike Noonan will become Chief of Navy, replacing Vice Admiral Tim Barrett, who is retiring. Lieutenant General Campbell will be promoted to General, Major General Burr will become a Lieutenant General, and Rear Admiral Noonan will become a Vice Admiral. We wish all these officers well in their new roles. General Campbell has had a distinguished career, outlined in the Prime Minister’s media release and press comment. 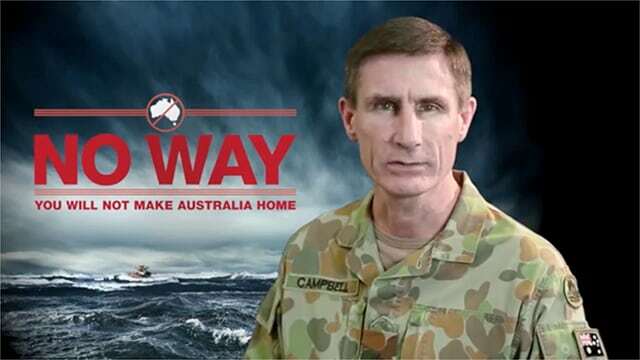 He fronted government advertisements discouraging asylum seekers from coming by boat; sticklers for the Westminster tradition (ministerial responsibility and so on) were a bit startled by this but General Campbell looked appropriately firm in the advertisement. More recently, General Campbell came in for some implicit criticism from Australian War Memorial Director, Brendan Nelson, for what Dr Nelson saw as unjustified treatment of Special Forces soldiers being investigated for posssible war crimes in Afghanistan. (‘Where is the national interest’, the Director asked, ‘in tearing down these heroes?’) Dr Nelson’s outburst on that occasion could also be seen as outside the normal remit of publicly appointed office holders. General Burr will fill the ex officio Chief of Army position on the Council of the Australian War Memorial. The Council is already positively jangling with brass, so General Burr will feel quite at home, as will Admiral Noonan, who will take up the Chief of Navy ex officio post on the Council.